GrimmSpeed External Wastegate UpPipe - Dezod Motorsports Inc - Home of the automotive performance enthusiast since 2002. The entire EWG Up-Pipe is made of 304 SS(flanges, flex, tubing) and has a pipe-wall thickness of 14 Gauge, this is the most “heavy-duty” pipe you will find. Many other pipes use cheap thin steel and are marketed as “super light weight”, not us. The inlet size is 1.92” and the pipe tapers down to 1.72” which acts as a funnel as it moves into the turbo allowing for the smoothest transition and best air-flow quality. The one of a kind Triple Layer Flex Joint is not located in the bend, which adds to the life expectancy of the flex section. Our outlet size is a perfect match to the most common stock location turbos allowing for a smooth transition into the turbo. Also available with the EWG Up-Pipe package, a bracket to hold the stock internal wastegate shut. This bracket is helpful because the turbo door does not need to be welded shut, decreasing the chance for leaks and allowing for easy removal if necessary. 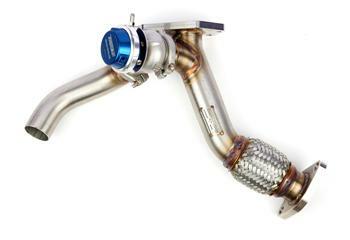 Availabe for many popular turbos, check the box below if you would like to add one to your order. The GrimmSpeed™ EWG Up-Pipe Kit fits more downpipes than any other EWG Up-Pipe on the market. Even fits large TurboXS 4” Bellmouth Downpipe!! TRIPLE LAYER Quality Flex Joint – Gives you extra durability compared to competitors single and double layer flex joints. Flow through Flex – There are no big steps in the flow path of our flex joint. Our flex is not located on a bend so there is very minimal flow loss(if any) through the flex. Curved EWG Side Outlet – Our ewg up pipes come with an angled side outlet which allows us to obtain optimal flow to the external wastegate. Pipe to Flange Connection – Much smoother connection. Piping is ported flush with flange so there is no step into the pipe.